He’s been the favourite for the $500,000 Newhaven Park Country Championships Final since the series started but it wasn’t until this afternoon Noble Boy actually qualified for the race. 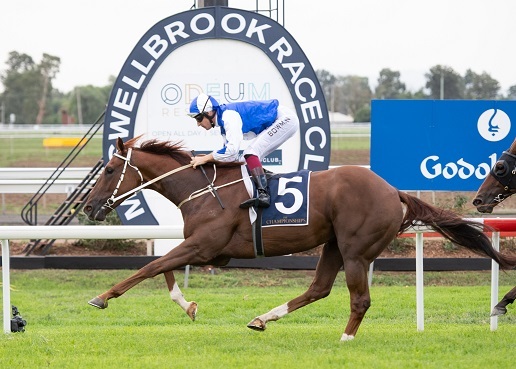 The $50,000 Wild Card at Muswellbrook Race Club provided the best horses who had missed out on qualifying in their regional heat one last chance to earn a start in the final and Noble Boy (Hugh Bowman) and Safe Landing (Sam Clipperton) got the job done. While Clipperton took Safe Landing forward, Noble Boy gave them a fair start but began picking them up as he rounded the home turn. Safe Landing gave a good kick with 200m to go but Noble Boy managed to run him down and win by one-and-half lengths. Noble Boy (Hugh Bowman) salutes in the Country Championships Wild Card. Credit: Katrina Partridge. Hugh Bowman, who has never been beaten on Noble Boy, made the trip up to Muswellbrook Race Club especially for the ride after a huge day at the Golden Slipper. After finishing fourth with a luckless but gutsy run on firmer ground in the South Eastern Regional Qualifier at Goulburn, Blowes wasn’t leaving anything chance this time. He took Noble Boy up to Muswellbrook on Wednesday night to allow him to get comfortable with his surroundings. Safe Landing was game in defeat and trainer Kurt Goldman was pleased his plan for the horse came off. “I wanted Sam (Clipperton) to roll to the front and I think we just ran into a really smart horse,” he said. “I’m very happy with my horse and he came back from that Goulburn run and did exactly what I thought I could today. Watch replays from all nine races at Muswellbrook today here.